Traditional Catholic artwork is highlighted on a series of unique scroll-shaped flexible rubber magnets. Perfect to enclose in a card. 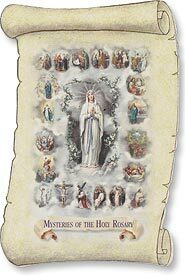 -- Rubber/Laminated Finish -- 2" W x 3" H A tiny picture of each mystery is seen around the image of Our Lady of Lourdes.